The San Diego County Board of Supervisors today unanimously adopted a resolution in support of efforts by the San Diego County Water Authority to recover nearly $250 million in illegal charges imposed on local water users in recent years by the Metropolitan Water District of Southern California, and calling on MWD to end ratepayer overcharges, overspending and unplanned borrowing that have contributed to MWD doubling water rates over the past decade. In conjunction with the action, the Water Authority released a study that shows ongoing ratepayer overcharges will only worsen unless the Los Angeles-based agency makes major changes to rein in out-of-control spending. MWD overcharged ratepayers $847 million more than the agency’s own budgets said was needed from 2012-2015. MWD overspent its budget by $1.2 billion from 2013-2016 on things like buying Bay-Delta islands ($175 million) and turf replacement ($420 million). In 2016, MWD authorized $900 million in unplanned borrowing to pay for its overspending. Supervisor Dianne Jacob commended the Water Authority for developing water supplies for the San Diego region that have cut reliance on MWD by more than half – and for leading the charge against MWD’s flawed fiscal practices. At today’s news conference, the Water Authority shared a new analysis – based on data from MWD and its member agencies – that shows MWD’s existing programs and projects can meet water demand projections under all of the hydrological conditions assessed through 2040. That means MWD’s multi-billion dollar plans to develop new supplies are not needed to meet its member agencies’ current or future demands. 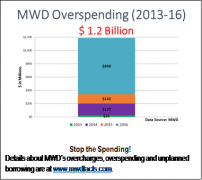 Instead, MWD’s continued overspending would significantly increase the financial burden on ratepayers and create significant stranded assets. The study details how MWD is undercounting local supplies being developed by water agencies across Southern California. Unrealistic projections mean MWD is grossly overstating how much water it says its member agencies plan to purchase from MWD, by more than 300,000 acre-feet in average years from 2020-2040. The study shows that MWD isn’t accounting for more than 30 local water agency projects that will reduce demand for MWD water, nor has it accounted for long-term water-use efficiency standards being developed by the state that will decrease demand for MWD’s water. As another sign of poor fiscal management, MWD’s water rates have already been declared by a San Francisco Superior Court judge to be illegal. The judge ruled in 2015 that MWD set illegal rates from 2011-2014, forcing San Diego County ratepayers to subsidize other MWD services and water rates. The judge ordered MWD to pay the Water Authority more than $243 million and to set only legal rates in the future. The appellate court is expected to hear the case this spring, with a decision expected later this year. Two additional lawsuits covering rates from 2015-2018 are pending because MWD has refused to limit the rates it charges to the actual costs of the services it provides. The news conference was the public launch of an education campaign led by the Water Authority to reform MWD’s spending practices that impact nearly 20 million residents across MWD’s six-county service area. The Water Authority is taking a leadership role to inform elected officials across Southern California about the need to pay more attention to MWD’s finances and governance. In recent months, Water Authority Board officers have sent a series of letters to elected officials across Southern California addressing MWD’s unplanned spending and borrowing. Many of the cities served by MWD don’t have direct representation at MWD, leaving many city leaders unaware of how freely MWD is spending their residents’ money, particularly given the lack of transparency at one of the nation’s largest water agencies. The Water Authority’s letters, along with supporting documents related to the Stop the Spending! campaign, are at www.mwdfacts.com.